Did you know that homeowners in the Grand Rapids area waste thousands of dollars each year by constantly heating their garage, when that effort is put to waste with a drafty door? We know how brutal the weather can be in this area which is why Window World of Grand Rapids is proud to offer replacement garage doors that insulate your space and keep heat inside. What’s even better? Our garage door systems are backed by our incredible Lifetime-Limited Warranty. Express yourself with Amarr’s Oak Summit Collection through durable steel options. Choose from a variety of doors, decorative hardware and window accents to further enhance your home. A classic looking door never goes out of style. The Heritage & Stratford collections provide you with a heavier gauge steel and both collections feature durable low-maintenance doors in a variety of traditional styles. Actual paint colors may vary from samples shown. 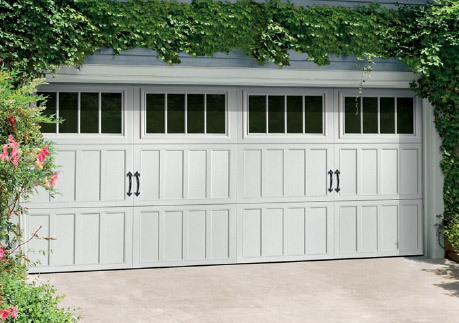 Looking for a garage door option that looks like real wood, but is made from durable, low-maintenance steel? The Classica Collection of Carriage House Doors give your exterior a fresh and clean look through three-section tall designs. Actual paint colors may vary from samples shown above. Amarr steel doors are pre-painted, and for custom colors, exterior latex paint must be used. *Price Upcharge. With triple-layer construction, a thermal seal and superior insulation, Designer’s Choice & Olympus Collection provides sturdy and low-maintenace door options that will enhance the look of your exterior. Choose from decorative options like window styles all the way to vivid color choices. Enhance the Look of Your Garage Door! Utilize our expansive collection of truly customizable options from Window World of Grand Rapids. If you have any questions, call our friendly staff at (616) 988-9996 or schedule your free in-home estimate today. Let’s get started!